Does anyone reading this believe in ghosts? Do you think those little orbs that show up in photos are spirits trying to communicate? Do you spook yourself when the lights are off? Do you get nightmares for days after watching a scary movie? Well try not to get nightmares after viewing these horrifying nails. Truly...terrifying. Rotated to be upside down for better viewing. Awkard? See? Terrifying? Not in any way adorable or cute. For this one I used China Glaze's Secret Peri-Winkle as the base, Sally Hansen's Insta-Dri Whirlwind White for the stamp (BM plate 223), and Time Off from the Sinful Colors Nail Art brush for the outline. It was tedious to say the least. And my right hand suffered. But it's worth it, and I'm happy to share it with you all. 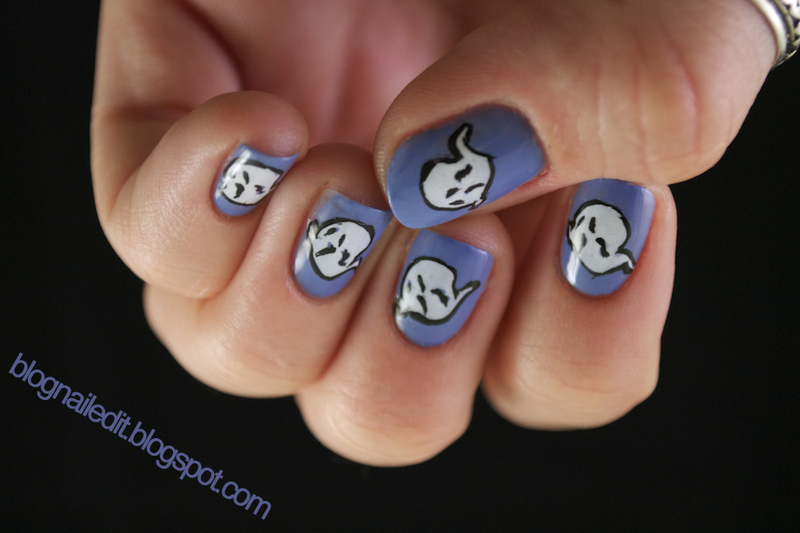 Well, I might not have been afraid of ghosts before, but now I am because as you said, these nails are sooooo terrifying! These are great! Amazing design! @nevorpurify Haha! Yeah, these little guys will haunt you in your sleep. And thanks! I read for 2 hours every night before bed-really scary psychological thriller type books and I live for horror movies-I don't normally get nightmares-but have freaked myself out after watching Paranormal Activity the first time! 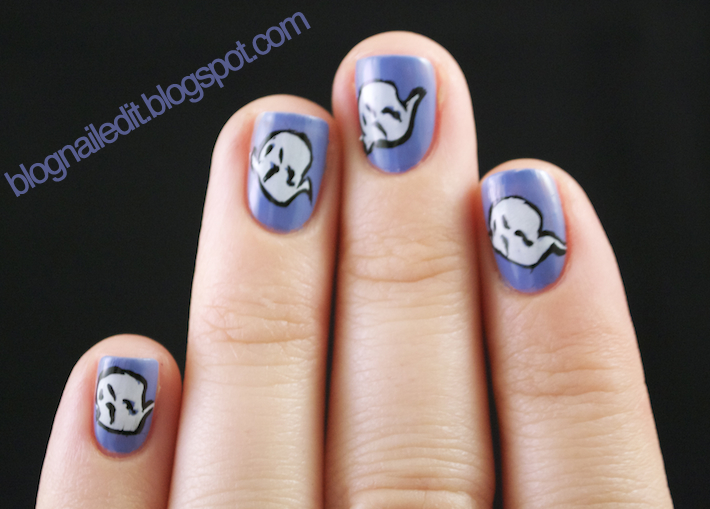 I am not sure if I believe in ghosts-but this mani is so cute! @Fingers Paranormal Activity is definitely the most jumpy movie I've seen. What's really scary is that those types of things can happen to normal people-pots rattling, strange noises, creaking. Ugh, terrifying!